Where to start? Earth to Emily was an accident. I had thrown out a few clients that Emily and Jack were working on when drafting Heaven to Betsy, the first Emily romantic mystery. I picked up the story of good-guy-in-a-bad situation and imagined it back to its inception, which required it to crossover the other storylines, in this case, Jack, the love interest, and Emily’s family life. As I sit here typing, it defies my own imagination where my husband and story partner Eric and I came up with it. 😀 Just kidding, sort of. In the second book featuring Emily, I wanted to figure out what happened to her father. From there it wasn’t a stretch that I wanted his path to intersect with Jack’s and create a rift between Jack and Emily. I needed a murder to start the book—it’s a mystery after all—and it had to relate to the father storyline and the good-guy-in-a-bad-situation client plight.Pretty soon we realized that meant we would be crossing state lines with “goods” in commerce, thus we’d need to involve trucking or railroads, and trucking fit best. We needed to incorporate Betsy, Jack’s family, Judith, Emily’s mom, Wallace, Nadine, Mickey, Laura, Jarhead, Melinda, and Clyde. We had baggage to resolve with Collin and Tamara. I wanted to set up future Ava novels with an appearance by her. I wanted to test Emily’s heart for children, to see how far she’d go to help kids in need, even at risk to her relationships with Jack, Wallace, and Betsy. I had to figure out the magical realism (or what I think of as practical or everyday magic) element. And we needed a big ending with Emily using her brains, brawn, and special skills to save the day. As usual, I was having trouble putting the elements all together at first. It’s always such a big wish list, and in the beginning feels insurmountable. It’s funny, though. When I think back on writing Earth to Emily, I don’t remember fretting about the plot or Emily’s personal journey. The one thing that resonates with me, that brings a smile to my face, is the Native American “magical realism” element. That was the piece that, when I figured it out, pulled the book together. But it wasn’t easy. The Mountain Spirit Dancers in Heaven to Betsy were a no brainer. I loved them, and I loved how the Mescalero Apache used them to teach each generation with humor—and not a little fear—about those things that could harm them. By using them in the first Emily book, I felt like I had exhausted the very best of the Mescalero Apache mythology, though, and panicked on where to go from there. I dug deeper, which is hard when you’re looking into a culture without a written history, except as recorded by people outside the culture. I mean, think about it. The whole point of Mountain Spirit Dancers is to teach in lieu of a written history. The dancers existed to pass on the learnings of history to the young. So my entire research was based on the interpretation of non-Apaches, which gives me the oogies. But it was all I had. Imagine that, in our world of instant gratification, of knowledge via the Internet at our fingertips. We’ve become so far removed from passing our history down verbally. By song. By dancers. By poems. By stories. They didn’t have the What Doesn’t Kill You romantic mystery series, for goodness sakes!! I dug deeper, and I found the Mescalero Apaches’ incarnation of foreboding and evil. Not the devil, more like a Grim Reaper, if you will. For them, the Owl, sometimes called the Owl Man, embodied these things. The Mountain Spirit Dancers taught the children that the Owl Man would sometime eat children. And when I read about this, it was like a bomb went off in my head. From there, the story unfolded neatly with the Owl/Owl Man as the glue that symbolically held it all together. I am interested: how many of you caught the Owl “drops” throughout the novel, and if you did, what did they mean to you? 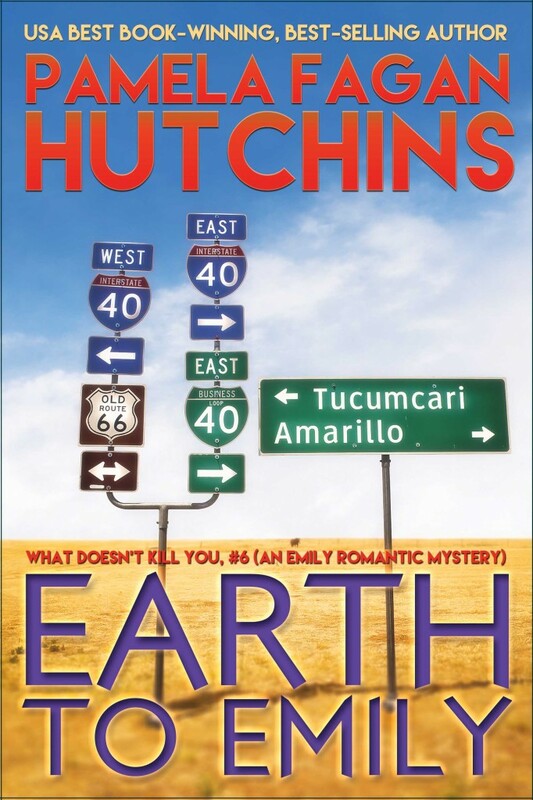 Do you find the “magical realism” in books like Earth to Emily a plus, a negative, or neutral? By the way, I’ve always loved owls. We have little ones in the trees behind our Nowheresville house most evenings, and there’s a huge barn owl that lurks overhead all day in the loft window of my friend Lisa’s barn in Snowheresville. Owls rock. But after writing E2E, they spook me a little more than they used to. The Owls always stand out to me, the same way they do to me in real life…. as, spooky, in a mystical way, and some one is watching….not someone is telling me something… Hair stands up on my arms…. One night, not to long ago, I had to make a run to Walgreens late at night… It was eerie silence and I paused at the end of the street to turn the corner, and as I did, there was an owl, sitting on the very top of the light post, starring right at me, like through the windshield looking at me…. I just sat there, starring back for a moment until he rotated his head a few times and flew away. It spooked me because it felt like he was bringing me a message or something… I drove very slowly and felt creeped out all the way there and looked for him on the way back. I never saw him again. I thought of your book. I have never found them spooky unti lately. Even now I am so awed and excited when I see them that the awed feeling overcomes the spooky. There is something really cool about Owls, as of course you know. They are that silent observer, the one that you dont even know is there but might be right over your shoulder. When they are still the are so incredibly still its like everything else is moving around them. And yet when they are in attack mode they can be awesome. I am building a dang owl box.